Couterfeit HP toner may look and feel like original HP toner, but they will not perform the same as the original HP toner, and won’t deliver the quality and reliability you expect from HP. Counterfeit HP toners are illegally sold to unsuspecting customers as genuine HP toners. It is easy to discern differences between genuine and counterfeit HP print cartridges. HP places a security seal on the packaging of many of its cartridges so that it’s easy to distinguish between genuine HP versus fake. HP recommends you check that an HP security seal is on the packaging and also verify the seal performs as described on this website. Keep in mind that most counterfeit HP cartridges also contain a fake security seal on the packaging. Checking for a security seal is not enough. Make sure the security seal performs exactly as described to ensure that you are purchasing a genuine HP cartridge. All HP toner cartridge models sold throughout the world contain a security seal on the packaging. HP applies a security seal only to inkjet cartridges in select geographies. Most inkjet cartridges intended for sale in the United States and Canada do not have a security seal on the packaging. All HP cartridges intended for sale in Latin America countries contain an HP security seal on the packaging, with the exception of cartridges displaying the HP Designjet brand. In addition, the newest HP security seals make verification simple by incorporating QR codes you can scan with a camera-enabled Smartphone to instantly verify authenticity. Turn the HP box from side to side, the colors on the seal will change from light to dark. When the background is dark, half of the lettering “ORIGINAL TONER” or “ORIGINAL INK” is light, and vice versa. Tilt HP box front to back to see “OK” and “(check mark)” move in opposite directions. Tilt box right to left to see “OK” and “(check mark)” move in the same direction. Download a QR code scanner app to your camera-enabled Smartphone. Scan the QR code on the security seal. You’ll receive instant verification from HP. If your phone doesn’t have a camera lens, you can validate HP security seals online by going to HP.com/go/ok and entering the serial number from the seal. HP doesn’t offer heavily discounted genuine print cartridges, so suspiciously low prices may be an indication that the cartridges for sale are counterfeit. If the price seems too good to be true, the cartridge probably isn’t genuine. HP recommends you only purchase HP cartridges from reputable and recognized retailers. All genuine HP print cartridges come packaged in a box bearing the HP name and logo. The packaging should be undamaged and previously unopened. HP doesn’t sell individual cartridges without standard outer wrapping or packaging. 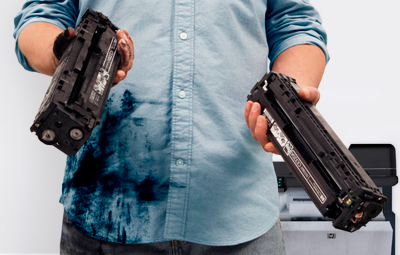 In addition, all HP print cartridges should look clean and new before installation. Scratches or signs of previous use on the body of the print cartridge indicate a non-original product. HP prides itself in providing cartridges that are reliable and perform to the highest standards. Cartridges that provide low-quality performance or fail prematurely may indicate the print cartridge isn’t genuine. The performance of genuine HP cartridges is guaranteed to provide sharp, clear, consistent printing throughout the entire life of the cartridge. Ink streaks, leaks, or toner dust are telltale signs that a cartridge may be counterfeit product. Protect yourself from counterfeit HP toner, Watch HP Counterfeit Toner Video.